Instant book to secure your dates! *Just STEPS to Mission Beach AND Bay, Pacific Ocean, City VIEWS, bike paths, parks, the boardwalk, walking distance to restaurants, minutes to Sea World, close to all major freeways, 10-15 minutes to Down town and Airport! *Entertain: NEW REMODEL, open concept, 5 decks/patios, Modern, comfy w/ NEW FURNITURE! 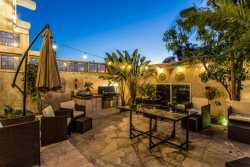 *Steps to MISSION BEACH and the PACIFIC OCEAN, close to other surrounding beaches, the boardwalk, Belmont Amusement Park AND walking distance to restaurants, activities, attractions, water sports, grocery stores, farmer's markets and in the heart of Mission Beach! Super close to SeaWorld. *"Mission Beach Jamaica" Where home is paradise and I love to share this home to others. I enjoy playing beach volleyball in South Mission Beach, walking to restaurants and bars. We're in the perfect location...on a courtyard walking street with the OCEAN & SUNSET views, STEPS to the beach, step out to the boardwalk with two way line bike paths. The home is designed to entertain. We are ALWAYS trying to make your vacation experience better. So feedback is important! BOUGHT ALL NEW FURNITURE & BEDS. SEE NEW PHOTOGRAPHS. There are 3 rooms wheelchair accessible thru the garage (ground floor) however, living room, dining room, kitchen, and rooftops are not. Sofa beds are upgraded mattresses and sleepers are additional twin bed chairs. We have a variety of mattresses and pillow construction, i.e. Foam, spring and firmness so I can direct you to the best bed for your needs. For your personalized comfort we have shutters in the bedrooms (not the loft) four ceiling fans through out home which include the bedrooms and living room & floor fans in each bedroom closet. Yes, we can accommodate an early check-in and/or late checkout! Our standard check-in is 4 pm and checks out is 10 am. See house tips w book. Yes, we may accommodate extra guests. We need an accurate guest count day and night. The more the merrier; must respect neighbors. Enjoy! Primp in 3 BRAND NEW Bright Bathrooms, with Large Mirrors, Granite, Two Person Shower in Master and Shower/Tub in Guest Bathroom with Ventilation via Windows and Fans. BOUGHT ALL NEW FURNITURE & BEDS. 3 Bedrooms, 1 Loft –6 Beds, 3 Sofa Beds, (Sleeps 17) • Bedroom 1 – Master Suite with Spa Master Bathroom - 2 Double Beds (Sleeps 4) (1st floor) • Bedroom 2 - Guest Room - 1 Queen (Sleeps 2) (1st floor) • Bedroom 3 - Guest Room - 1 Queen (Sleeps 2) (1st floor) • Bedroom 4 – Loft Upstairs - 2 Twin, 1 Twin Trundle (Sleeps 3) (3rd floor) • Living Room, 3 Comfy Sofa Beds w/ Upgraded Mattresses, 2 Queens, 1 Double (Sleeps 6) (2nd floor) Sofa beds are upgraded mattresses and sleepers are additional twin bed chairs. We have a variety of mattresses and pillow construction, i.e. Foam, spring, and firmness so I can direct you to the best bed for your needs. For your personalized comfort, we have shutters in the bedrooms (not the loft) four ceiling fans throughout the home including bedrooms and living room & floor fans in each bedroom closet. BEST WAYS TO SAVE ESPECIALLY IF YOUR DATES ARE FLEXIBLE! Book Weekdays: Save up to 65% off when you book your vacation on week days. Monday, Tuesday or Wed. are up to 65% off! Then Thursdays and Sundays are the next least expensive. Book for a Week: Lengthen your stay to 5-7 days or a month and get a bigger savings the longer you stay depending on the season. (Summer and holidays excluded.) Book In Advance: (at least 6-8 months to a year) and you get the standard rates vs. the seasonal adjusted rates. (Does not apply for the highest seasons, i.e. summer/holidays.) Book Last Minute Available Dates for the Current Month: We sell up to 25-31 days a month but sometimes a few days during the month that do not sell, i.e. days after holidays. These dates are 65% off. My calendar is up to date and live. Join Cancellation Deals List: We try to help guests get a refund by booking a last minute cancellation. Just email me and I can notify you when I have a cancellation. Book Last Minute Available Dates for the Current Month: We sell out 25-31 days a month but sometimes we have a few days that month that do not sell, i.e. days before or after holidays. The prices for these dates fluctuate based on demand. My availability calendar is up to date and live. Book Non-high Season or Non-Holiday Weekends or Weeks. This is a tough one because Southern California is a vacation destination all year with special events scheduled year-round. The less busy months tend to be non-holiday weeks, events, or graduation weeks of Oct., Jan., Feb., May with great weather. Invite Your Friends and Family. My homes sleep 16-30 and splitting the fix rates by 16-20 you all enjoy a super savings over hotels. Bottom line vacation homes versus hotels save you money on meals and drinks as you don't have to go out to eat three meals a day. And hotels charge more tax, parking, internet, movies, etc.